1. Sign up for an Hypothesis account yourself. While you will register at the Hypothesis site, you’ll more typically be signing in through the annotation sidebar after activating it using the Chrome extension. 2. Get the Chrome extension. Because Chrome is the optimal browser for using Hypothesis, we recommend downloading Chrome on your personal computer if you haven’t already and adding our Chrome extension. You can do so at our website or through the Chrome store. 4. Demo the Hypothesis annotation app in class if possible. 6. Send out a via link to the text you want students to annotate. Found under the share icon in the upper lefthand corner of the annotation sidebar, this is a special “via” link that wraps a webpage in the Hypothesis app–manually prepending any URL with “via.hypothes.is/” works the same way. 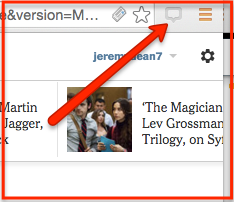 Visitors to the proxy page will see the annotation sidebar and be able to view existing annotations. If they have Hypothesis accounts, they will also be able to annotate without the Chrome extension. You can also include via links for multiple texts within an online syllabus. 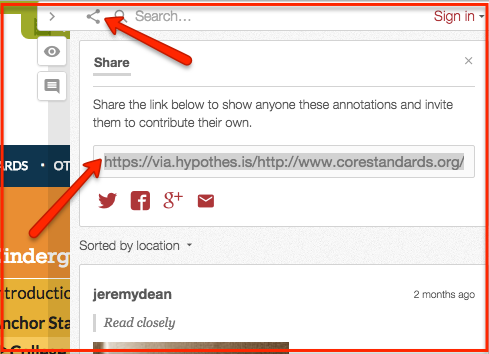 Note: you might skip this “via” step if you would like your students to use the Chrome extension to annotate. Just send them the regular URL of the page you want them to annotate and instruct them to activate Hypothesis using the Chrome extension (through the button in the upper righthand corner of the browser pictured below). 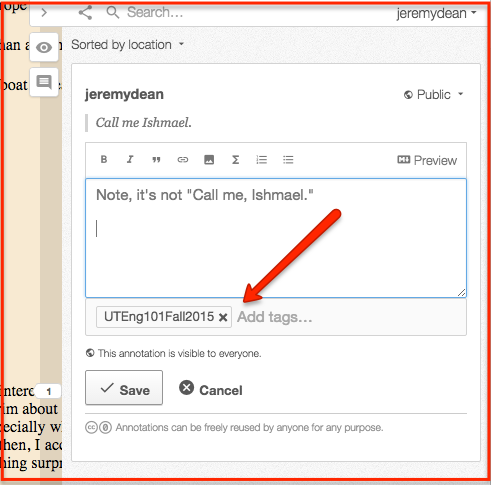 We recommend that you have students tag their annotations with a course tag (“UTEng101Fall2015,” for example). This will allow you to watch their collective annotation creation in real time at the automatically generated stream at the Hypothesis site. You might bookmark this page in your browser. It also may be interesting for students to be aware of the stream as they can see and respond to their classmates contributions there as well. Visit our Educator Resource Guide for more materials about teaching with the Hypothesis tool.